Vinyl Restore is the solution if your vinyl siding is faded, discolored, oxidized, chalky, or covered with mold, mildew, or fungus, and other potentially health-hazardous micro-organisms. Vinyl Restore offers homeowners more than a vinyl siding cleaner. Vinyl Restore restores and protects vinyl siding. For Vinyl Restoration FAQs, click here. BEAUTY Spruce up the curb appeal of your home with brand-new looking shutters. Shutter Restoration brings back the color and luster of your shutters and highlights the wood grain that makes them beautiful. Once you see the beauty that was hiding behind your faded vinyl, you will want to spruce up all your faded surfaces. Shutter Restoration can also restore your faded and oxidized vinyl or aluminum siding, as well as painted wood shutters from fading and chipping. In addition, when you restore your shutters instead of replacing them you’re helping “earth beauty” as discarded vinyl products stay in the Earth’s landfills for thousands of years. See our Drive to a Million Campaign. FOR LESS The average builders’ grade shutter set ranges from $35-$68. Better quality shutters or custom sizes shoot up into the $100’s of dollars per shutter and that does not include paying for labor to install them. For a fraction of the cost Shutter Restoration will restore your dull, oxidized and faded vinyl shutters to like new, while protecting them from future fading. Just think! You can restore the color and luster of your faded shutters in a few hours while saving hundreds of dollars over buying new vinyl shutters! Painting your shutters costs you money (buying primer, vinyl ready paint, tape, rollers, etc) and most importantly time and headache. Painting requires taking down your shutters and putting them back up, Vinyl Restoration does not!!. To make it even worse, paint will fade again in a few years then then you will have to do the job all over again. Do You Have Stubborn Scuffs and Stains? Deck Restore removes and cleans difficult stains and scuffs easily. It is not a paint or a coating that Vinyl Restore gives your home a brilliant new look by restoring your vinyl siding like new. This revolutionary product will potentially save you thousands in vinyl siding replacement costs and protects your vinyl siding for years to come. You will also feel great knowing that you are doing your part for the environment – Vinyl Restore is non-toxic and environmentally safe. Replacing your vinyl siding not only costs a small fortune, but forming the vinyl material produces significant carbon emissions. With Vinyl Restore, you are helping to save the planet and the green in your wallet. 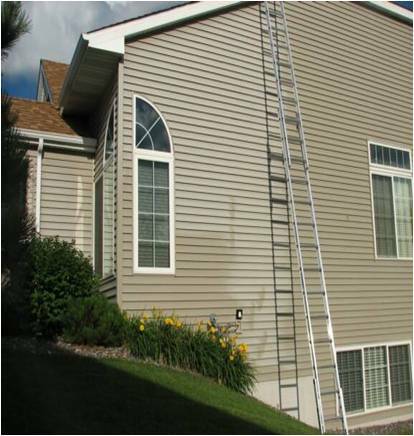 Vinyl Restore works in 2 ways – First we clean and remove oxidization, mold, mildew, and fungus from the surface of your vinyl siding. Then the Vinyl Restore Surface Shield is applied to protect your vinyl siding from harmful UV rays and the elements. Vinyl Restore does not equire pre-sanding or difficult stripping. 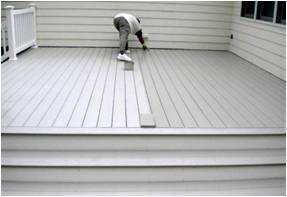 Instead, it is a cleaner that penetrates and revitalizes while helping your PVC Composite (vinyl) deck retain its natural stain resistant qualities.